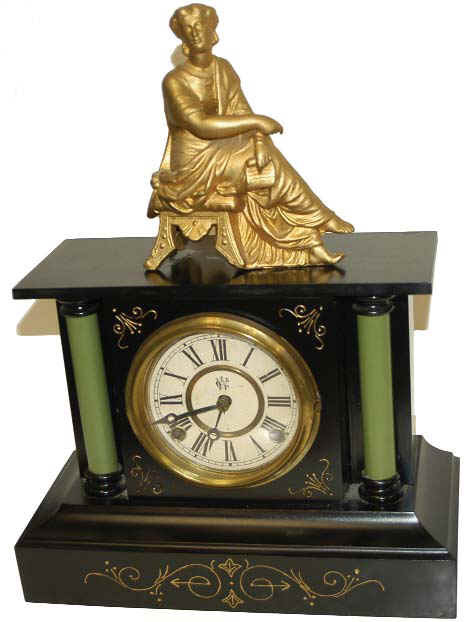 Waterbury Clock Co. enameled iron case clock with figure, "Palmetto", ca 1891. Case refinished, iron repainted, new gold in the etchings, and columns painted green. Case is 16.75 inches high, 12.75 inches wide, complete with metal back door, pendulum. The 8 day movement is their "Star" movement, with rack and snail count, half hour gong strike, and running. Ly-Waterbury #992.